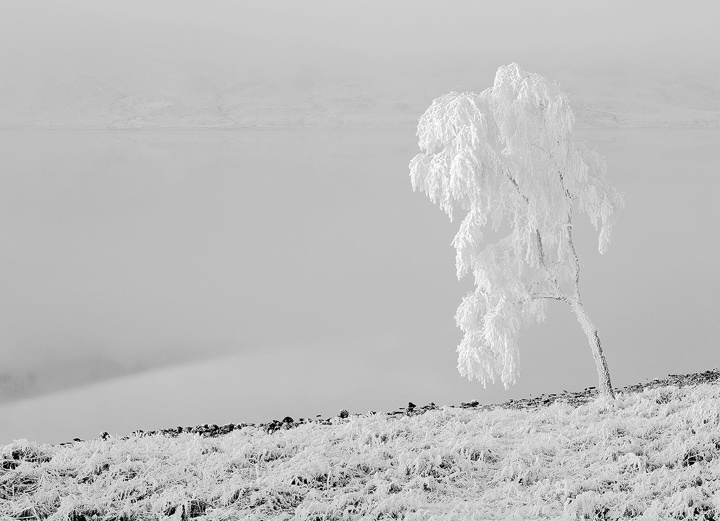 During one of the most memorably harsh frosts I can remember the temperatures dropped to a staggeringly low minus 23 degrees celcius and the hoar frost that formed covered every twig, branch and blade of grass to a depth of two inches. The phenomenal cold lasted three days and the temperature never once approached zero so the frost continued to build until it took on the appearance of snow. One tree in particular appeared to have the outline of a bearded old man and this became the prime focus of my attention. I converted this to black and white as it seemed to offer the best interpretation of the scene I saw.